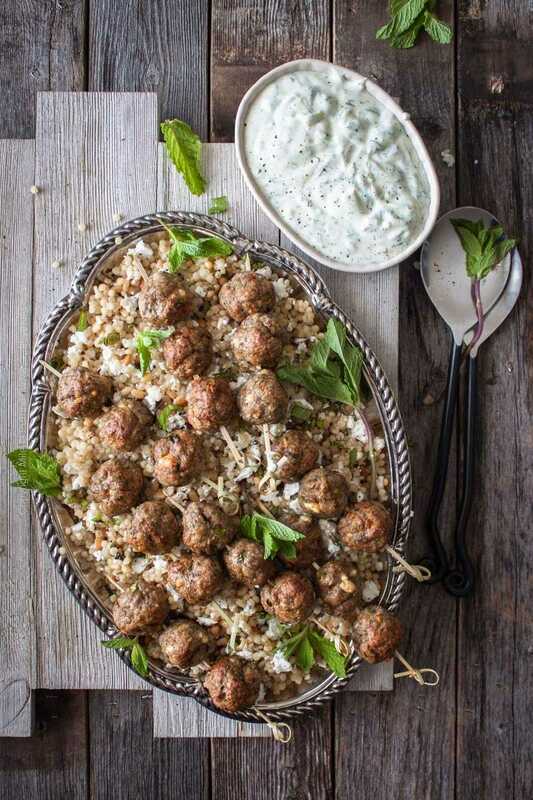 Lamb meatballs made with a generous cumin allowance, feta cheese crumbles and a touch of pilsner lager, served over buttery Israeli couscous with pine nuts, feta and mint, and accompanied by a delightful yogurt dip. Are you in? Psst. These are also perfect for stuffing pita pockets or eaten with a tomato cucumber salad. Objectively, I have to say that you will not taste much of the pilsner’s gorgeous bready flavors because this recipe calls for a lot of cumin which obliterates the subtle pilsner notes. It is worth it though, I promise. Cumin+ground lamb=heaven. The texture of the lamb meatballs on the other hand does benefit from the lager’s carbonation. They turn out light, plump and fluffy, with just enough density to hold all the juices. Simply perfect. We selected pilsner because it is THE beer style that best partners with cumin and feta cheese. I say that based on years of consuming all three in some shape or form. By the way, if interested, check out this Pilsner and Feta Cheese Fondue. 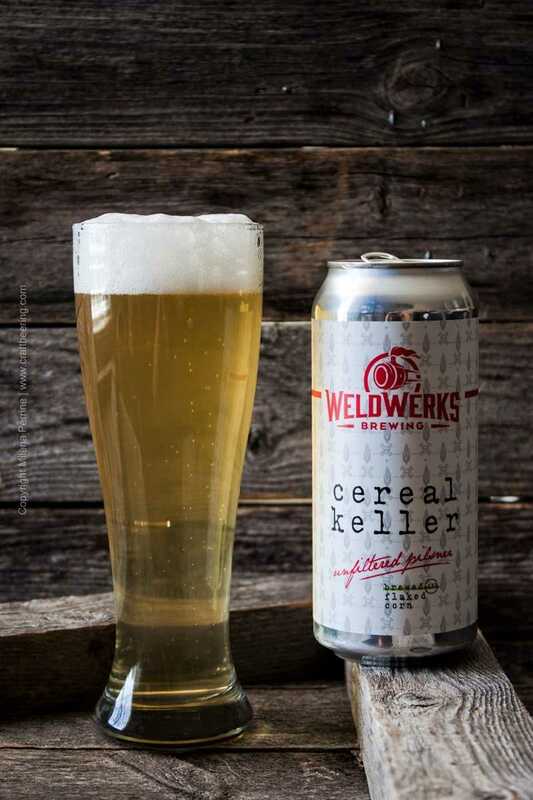 For the record we used a very delicious unfiltered pilsner, called Cereal Keller and brewed by our local WeldWerks Brewing. It claims to have been brewed in the Keller Pils tradition, but with 15 % flaked corn in the grain bill and less hops than a typical Keller Pils. To us it tasted nothing like a Keller Pils, but it was really good in its own right. We found it to have a very pleasant grainy sweetness and subdued Noble hops bite, very crisp and the carbonation was just right. With ABV 4.7% Chris and I enjoyed crushing two pint cans each with dinner. The lamb meatballs looked and tasted happy as well. 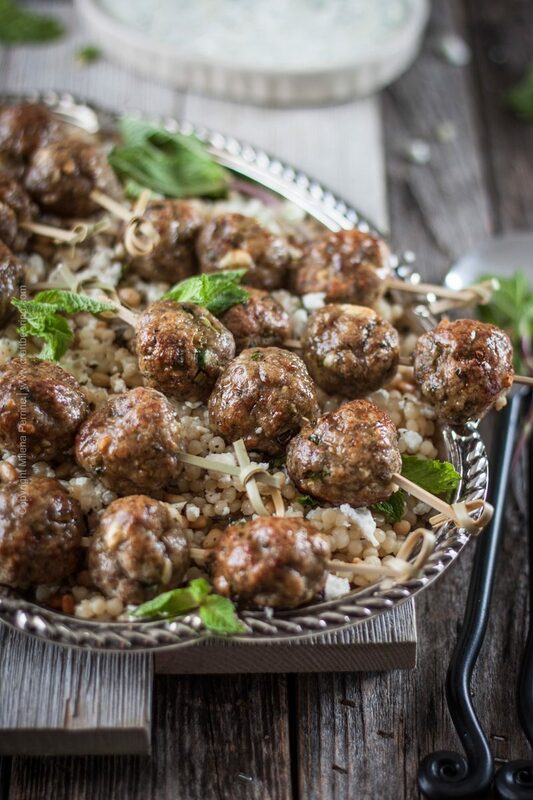 You can fry or bake these lamb meatballs, it is up to you. Well, technically you can grill them for the most amazing of results, but our circumstances involved snow. In the pictures, you see them baked. We both think that when they are fried they taste better than baked…most things do, don’t they? It is just that baking is much easier, especially when you are short on time. If you do decide to go with frying them, you may as well include some fries. Topped with feta, like these. If you go the baking route, have a small ramekin with olive oil and a brush handy once you take them out. Brush them with olive oil to prevent them from forming a crust. Even though they will be airy and juicy inside, an outside crust can form once out of the oven, especially here in Colorado where it is soooo very dry. Last, but not least – the yogurt dip and the Israeli couscous. You can make any yogurt dip, but I recommend my recipe🙂 The couscous has a ton of butter toasted pine nuts mixed in and as much feta and mint as you care to add to it. It is also cooked in chicken stock, for max flavor. You will enjoy. On a very personal note – these lamb meatballs are the first thing we cooked since our son had an emergency appendectomy after two days of excruciating pain and severe dehydration because he couldn’t keep anything down this past Easter weekend. We are so very grateful for his fighting spirit and the help he got in ER and the aaahmazing surgeon who operated on him. Lamb meatballs with feta cheese, cumin and a touch of pilsner have the perfect texture and taste nothing short of amazing. Light and juicy they are great served over couscous with pine nuts, feta and mint and dipped in yogurt sauce. Can be served hot or cold. In a mixing bowl combine all the ingredients except for the olive oil and combine using your hands until a uniform mixture is achieved. Prepare a parchment paper lined half sheet pan (or two quarter sheet pans). 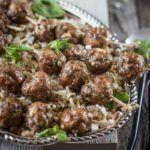 Dip fingers in the 1/3 cup of olive oil and start to form small meatballs (use a 1 tbsp measure to make them uniform in size). Place the meatballs onto the sheet pan. Bake for 25 -30 mins (depending on your oven) and let cool off for a minute before brushing with the 2 tbsp olive oil. In a large pan over medium low heat melt 1 tbsp butter and add the pine nuts. Stir and cook until they turn golden brown. Remove from pan and set aside. Melt the rest of the butter in the same pan over medium heat. Add the couscous and stir, cook until it is slightly browned. Add the chicken broth and season with salt and pepper. Increase the heat and bring to a boil. Stir well, reduce the heat to low, cover and simmer until the couscous absorbs all the liquid. Remove from heat, add the pine nuts, stir and let cool off slightly. Transfer to a serving platter, add the feta crumbles and mint and stir a little bit. Serve with the lamb meatballs and the yogurt sauce on the side. That sounds so delicious! Thanks for sharing at Sew It Cook It Craft It! You’re one of my features tomorrow when the new party starts! You know that I’m vegetarian, but there some dishes that just trigger my mouth to salivate 😉 . And these lamb meatball dish is one of them. Love the other flavors: mint and cumin, the yogurt dip, the Israeli couscous, the Pilsner, the feta! Loreto would be in heaven 🙂 . So glad to hear your son is getting better! He sounds incredible, what a joy and privilege to be his parents. Hugs to you all!! Absolutely perfect! A great pairing with the couscous and that great yogurt dip! Your little guy sounds like one very special individual! You know what they say – apple doesn’t fall far from the tree! Happy to know he is on the mend! And I get it – meatballs always make me feel better, too! I love the addition of feta crumbles! Found you on the CBBG group this morning! Didn’t have lamb so used ground beef , feta and pils. Loved the results and love what you are doing, so many recipes I will definitely try other ones! Grandmothers are always right! My family has a beloved Swedish meatball recipe that doesn’t use beer or baking soda and now I’m curious how they’d turn out with one of those additions. Just don’t tell my family or they’d disown me for making alterations :). These sound perfect paired with your yogurt dip! Have a great week, my friend! These look awesome, Milena! Love the pairing with the yogurt sauce and couscous, but also love the suggestion of having with a tomato cucumber salad. Lamb is something hubby and I really enjoy, but don’t realize how much we enjoy it until we have it, ya know? Have to try this one out soon! So many delicious flavours goin’ on. Your little boy sounds so precious! so happy to hear that he is on the mend. Hugs!